Semi-trucks, truck drivers, and the companies that operate them play an important role in our economy, transporting goods and other products across the country and around the city. However, when semi-trucks cause a car accident, the results can be disastrous. Trucking accidents can be caused by failing to secure cargo on a truck. When cargo is not loaded properly or secured properly it can fall off the truck, onto the roadway, and cause a hazardous, even deadly road condition. Insecure cargo also poses a risk to drivers and those loading and unloading cargo. Loaded semi-trucks carry thousands of pounds of cargo. If any of this cargo is not secured properly and falls off, it can create a dangerous, even deadly situation on the road. Trucking accidents can be caused by large, heavy items like steel coils or other items that fall off of a truck, or by small material such as gravel or small rocks. The destructive force generated by an object falling off of a truck is staggering. For example, a 20-pound object falling from a truck travelling at 55 mph creates 1,000 pounds of force upon impact. 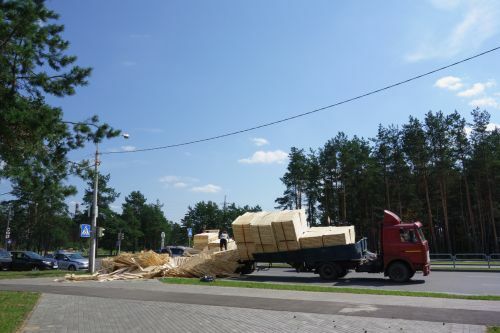 Improperly secured loads cause more accidents and injuries that many people realize. According to a 3-year study conducted by AAA, between 2011 and 2014 more than 200,000 accidents were caused by loose cargo or debris falling from trucks. Two-thirds of these accidents were due to unsecured loads falling onto the road or onto vehicles. The remaining one-third were caused when drivers swerved to avoid debris that fell onto the road. Unsecured or improperly secured cargo falling onto a car can damage the vehicle and injure its occupants. Other times, drivers swerve or brake to try to avoid falling cargo which, in turn, leads to an accident and injury. The Federal Motor Carrier Safety Administration (FMCSA), which regulates the trucking industry, requires that truck drivers secure loads. But when drivers fail to follow these rules, loads can fall off the truck and create a hazardous, even deadly condition. In a crash involving cargo falling from a loaded semi-truck your lawyer can seek compensation from the corporation that employed the truck driver, the broker that arranged the trip, the shipper, and the company that was involved in loading the cargo, as well as the individual truck driver. Depending on the type of load being carried, a truck driver may be required to tie down a load, use loose materials to support and protect cargo (dunnage), use chocks, wedges, or a cradle, or tie a load down using chains, webbing, ropes, or straps. Lumber, pipes, and steel coils can be particularly difficult to secure and, therefore, might fall off and cause a hazardous road condition. Other times, accidents occur when rear cargo doors open due to a shifting load inside the trailer. Accidents can also be caused when loose materials like gravel, sand, rocks, and other materials fly off of a truck and onto the road. The FMCSA requirements specify that the tie down must resist forward movement, backward movement, and lateral movement. Failure to properly secure a load can result in serious injuries or even death caused by loose cargo. Drivers are also required to make sure that they do not overload a truck. Federal regulations require that truck drivers and truck loaders be properly trained on proper techniques to secure and load cargo so loads don’t move, shift, or fall off. If cargo does fall off of a truck, it’s almost certainly because someone did not properly load or secure the cargo. A truck driver is responsible for inspecting the cargo he or she is carrying to be sure it is properly loaded and secured, regardless of who actually loaded and secured the cargo to the truck. And the driver’s employer is responsible for training drivers to know how to properly inspect cargo to be sure it was loaded and secured properly. Unlike a typical car accident, where you can only pursue compensation from the other driver, in a crash involving cargo falling from a loaded semi-truck your lawyer can seek compensation from the corporation that employed the truck driver, the broker that arranged the trip, the shipper, and the company that was involved in loading the cargo, as well as the individual truck driver. While this increases the likelihood of receiving higher compensation for your injuries, it also means that truck accident cases can be very complicated to handle. Robenalt Law has the experience, expertise, and resources to thoroughly investigate your truck accident case, and hold the responsible parties accountable. This often requires looking at the truck driver, the broker, the shipper, and the carrier, each of which have different obligations. An Ohio truck accident attorney will investigate all of the entities that were involved in arranging the loading of cargo to identify the safety consultants, brokers, and shippers. Often, this involves filing a lawsuit to correctly identify the parties and insurance companies involved. If you were injured or someone you love was killed because of cargo falling off of a truck or other vehicle, contact a skilled and experienced truck accident attorney as quickly as possible. Robenalt Law offers free consultations to discuss your case. Call 216-223-7535, complete our online form, or email trobenalt@robenaltlaw.com. Tom Robenalt started his litigation career representing trucking companies at a large firm in Cleveland. For the past 20 years, he has used that experience to help victims and the families of those injured to secure compensation for trucking accidents.